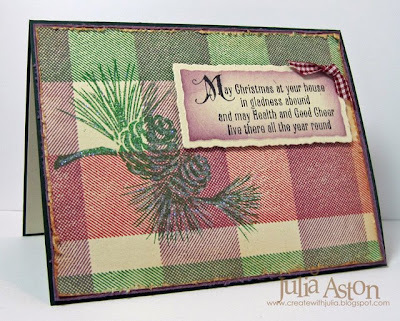 I made this card for the Inspiration Challenge over on Split Coast this week - my good stamping friend Anne Harada was hosting this week and what a wonderful homespun site she had to inspire us - The Country Porch. I didn't have to go any further then the home page - where this Pine Cone Kitchen set caught my eye. 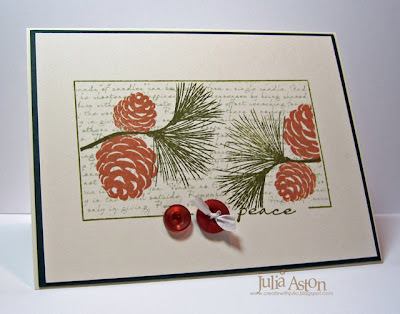 I stamped my own plaid background using the thick plaid stamp from Pic-Nic Patterns and then the pretty pine bough from Festive Foliage right over the plaid. I stamped the sentiment from Compliments of the Season and cut it with a deckled edge rectangle nestie. Then I just added a little gingham ribbon knot, some dazzling diamonds over the pine bough and distressed the edges. In case you cannot read the lovely sentiment - it says "May Christmas at your house in gladness abound and may Health and Good Cheer live there all the year round." 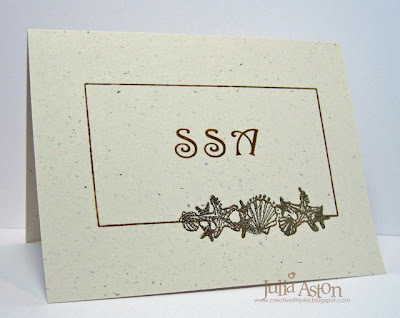 Hello dear stamping friends! 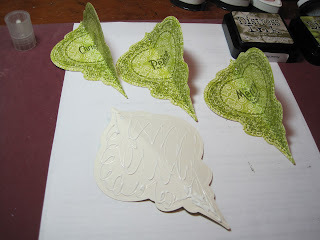 I'm feeling better every day - and I'm able to fit in a little stamping in between dozing and taking it easy! 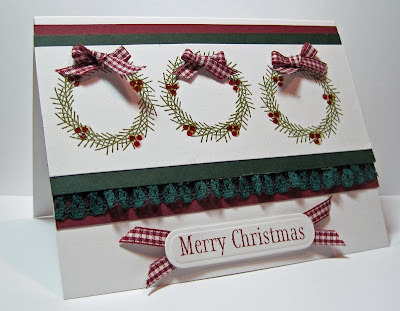 I have yet another Christmas card to share with you today - and it's also another one that is easy to make multiples of! Criminalgrace was the Featured Stamper over at Split Coast last week and I chose her sparkling Winter Skies card to case. 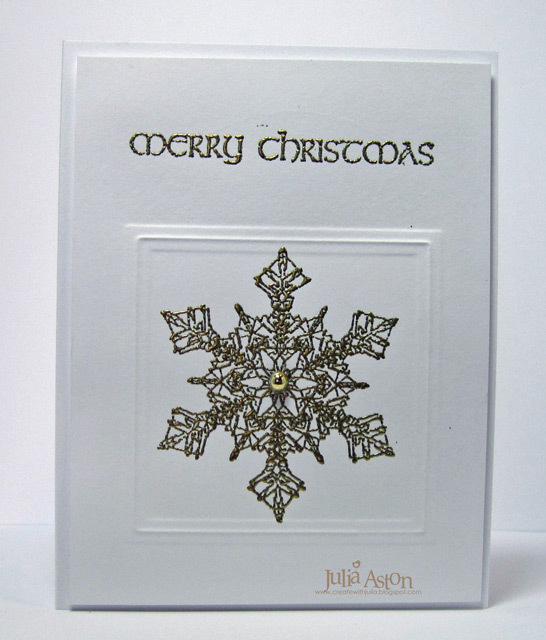 Instead of punching the snowflake - I stamped and gold embossed mine as well as the sentiment. My stamps are from Rubbernecker. 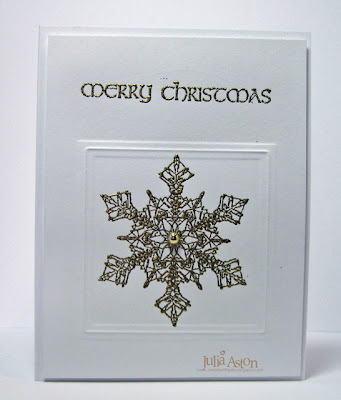 I flipped the sentiment to the top, dry embossed a Nestability square around the snowflake and added a sticky rhinestone to the center of it. The gold embossing is really shiny IRL - not so much in my pic unfortunately! It's Saturday - and time for another Waltzingmouse Sketch Challenge! Are you ready for it??! I was counting up how many Christmas cards I've made so far and I need about 15 more - so surprise, surprise - I used the sketch to make a Christmas card! It worked up really quickly and is easy to reproduce - just what we need as we come down to the wire right?! 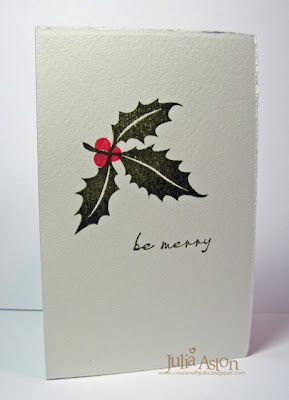 I used two Waltzingmouse stamp sets on my card today - Big Blooms - Poinsettia and the Joy piece of the sentiment 'boundle of Joy' from Frame It. I stamped the poinsettia on the white panel then sponged the edges and mounted it to gold and blue panels. My card is 4 1/4" x 4 1/4". Then make your own card using the sketch and link it on the Sketch Blog by Thursday 12/2/10 at 11:59 pm EST - you could be chosen Top Mouse next week!! Sometimes Claire offers little random winner prizes too - you never know! Accessories: gold trim - JoAnn Fabrics, gold pearls - Michaels, blending tool & nonstick craft mat - Ranger, foam dimensionals, 1" & 1 1/4" circle punches - SU. Welcome dear stampers to this Saturday's Waltzingmouse Sketch! The frame stamp (that fits in the Labels 14 Nesties!) and the wreath are from Twas the Night Before Christmas and this wonderful vinatage font sentiment is from Compliments of the Season. Then make your own card using the sketch and link it on the Sketch Blog by Thursday 11/25/10 at 11:59 pm EST - you could be chosen Top Mouse next week!! Sometimes Claire offers little random winner prizes too - you never know! In case I don't see you before Thursday - have a wonderful Thanksgiving (all those living in the US) - we certainly all have a lot to be thankful for don't we?? Let's all make a list to remind ourselves and read it at dinner on Thursday. 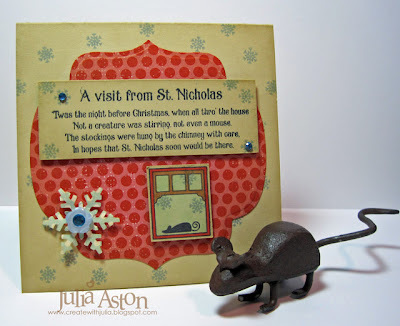 Stamps: Waltzingmouse - Compliments of the Season, Twas the Night Before Christmas. Ink: Ranger Distress: old paper, forest moss, aged mahogany, antique linen, snowflake embossing folder, Labels 8, Labels 14 & rectangle Nestabilities, wrinkled seam binding: www.prairiebirdboutique.etsy.com , foam dimensionals, 1 1/4" circle & 5/8" circle punches - SU, blending tool & nonstick craft mat - Ranger. Welcome to the Friends of Waltzingmouse Blog Waltz - it all starts in the playroom of the WMS forum - you can find all the details here. We hope you'll come join us! This month the theme is Christmas! 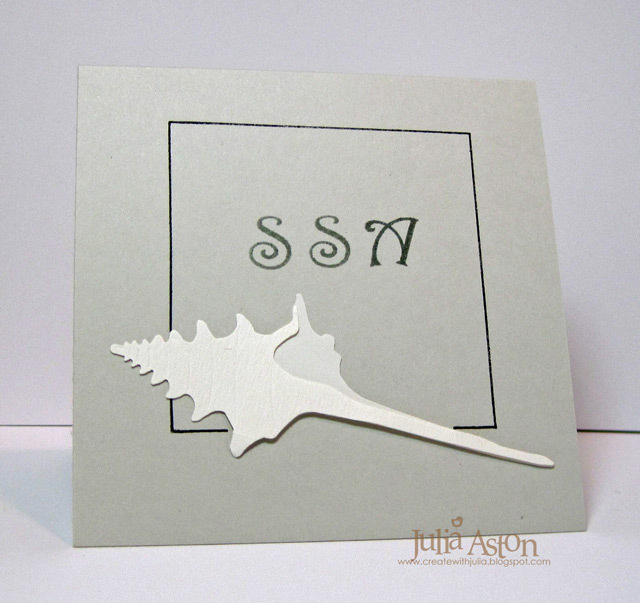 My card is clean and simple - I embossed the Nestability square right on the card stock. I stamped my tree (Teeny Trees) in black ink, then stamped the garland of stars in Versamark Ink and embossed it with gold embossing powder. I adhered the stamped panel inside the frame using foam dimensionals. Then I stamped the sentiment and DONE! 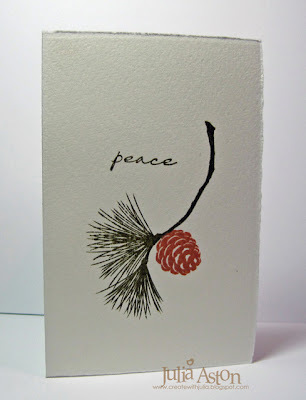 An easy design to make multiples of quickly - perfect for this busy time of year when we want to make our own cards but don't have tons of time. You can see how I embossed the frame on this post here. There's a contest going on during the waltz - and there could be hidden clue(s) on my picture - count them up and enter your total over in the playroom. A random correct guess will win a prize! As you are reading this - I am actually in the hospital - hopefully done with my surgery (scheduled for 7:30 am EST) and already on the mend in my hospital room. I hope to be home tomorrow or the next day and back at my computer so I can belatedly do the Blog Waltz and see all the wonderful Christmas Inspiration from you all! I'll be home recovering for about 6 weeks - no heavy lifting - but stamps aren't heavy - right???!!! I'd appreciate your prayers today. Accessories: gold embossing powder, hot gun, square Nestabilities, foam dimensionals. Hello dear friends! Today's card was made for the Inspiration Challenge over on Split Coast. 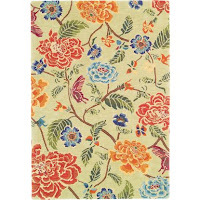 I was inspired by this lovely Mandarin Wasabi Rug . It reminded me of this pretty Cosmo Cricket patterned paper I had called Material Girl. The sentiment is from Rubbernecker and the pins are from Marks Finest Papers. I used Labels 8 to cut my panel and Deckled Mega Rectangles for my sentiment. I sponged all the edges with Ranger Distress Antique Linen. Wednesday I'm having my surgery but I will be posting my card for the Waltzingmouse Blog Waltz starting in the WMS forum Playroom so be sure to come by! 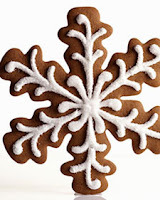 (check it out on my side bar and join in - the theme is Christmas! Accessories: foam dimensionals, wrinkled seam binding - www.prairiebirdboutique.etsy.com , pins & jewels - Marks Finest Papers, stylized flowers embossing folder - Cuttlebug, rhinestones - Kaiser, Labels 8 and Deckled edge mega rectangles - Nestabilities. Welcome my friends! I haven't been posting as much as usual this week, lots of things going on in my life right now and I'm trying to juggle it all. I'm having some elective surgery next week and I had to go off of an anti-inflammatory medication I take for the arthritis I have in my knees and now my whole body is aching! I love this CAS (clean and simple) sketch we have today, don't you? It's nice to have a simple one that you can do that way or embellish if you're in the mood! Here's the card I created from our sketch today. 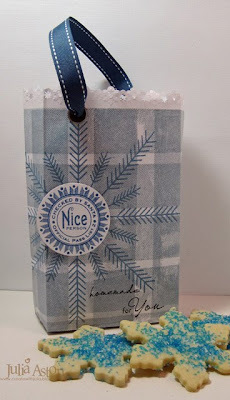 I used the front and back of the same Graphic 45 patterned paper for the background. I just love the fleur de lis -style pattern on it as well as the colors - a little dark for the holidays but still festive I think? I stamped my ornament from Vintage Ornaments, cut and embossed it with my ornament nestability and then sponged the edges. The sentiment is from Seasons of Love and I used a text stamp from Text It for the background. It's cut and embossed with a Deckled Edge Mega Rectangle Nestability and I sponged it before taking it out of the die. Then I just stapled a piece of twill on the ornament and added a few rhinestones for some shimmer. I used foam dimensionals to pop up the ornament. We hope you'll join us this week for the WMS sketch challenge - check out all the details here on the WMS Sketch Blog and get inspired by the cards the Mischief Makers and other DT members have created using this week's sketch. 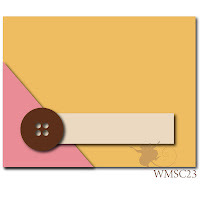 Then make your own card using the sketch and link it on the Sketch Blog by Thursday 11/18/10 at 11:59 pm EST - you could be chosen Top Mouse next week!! Sometimes Claire offers little random winner prizes too - you never know! Hope you are enjoying this lovely fall weekend - I'll be raking leaves with Kent! PUBLIC SERVICE ANNOUNCEMENT: Dave over at Rubbernecker is having a big sale on stamps, Spellbinders, Ranger products, Bind it all and more - check it out here Sale ends Sunday 11/14 at 6 pm PST so hurry! 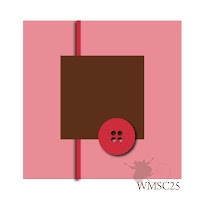 Stamps: Waltzingmouse - Vintage Ornaments, Text It, Seasons of love. Accessories: foam dimensionals, Heirloom Ornament 2010 & Deckled Edge Mega Rectangle Nestabilities, twill - PTi, rhinestones - Michaels, staple - Close to My Heart. 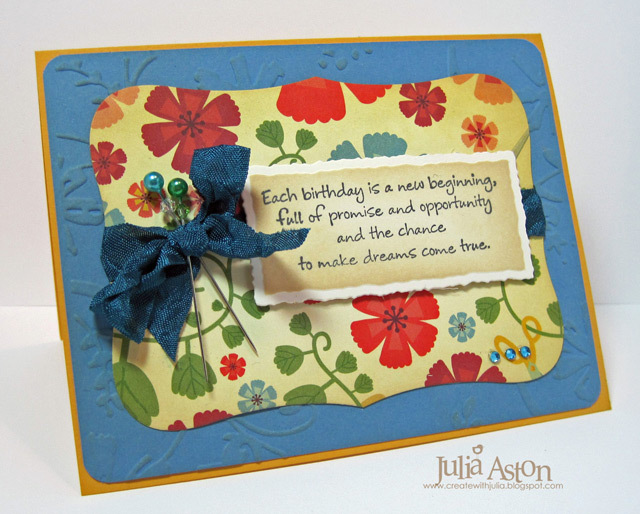 I wanted to share with you a card I made for my son, Joshua's, 33rd birthday in September. The picture is a photo of the gas tank on his motorcycle - or I should say - his former motorcycle. Every mother's nightmare - Josh had an accident on his bike right around his birthday - a woman cut him off and he slammed right into the side of her minivan. He crashed into her side window - but thank goodness he had on a full face helmet that totally protected his head (it was all deeply etched from the impact). Then he flew over the handlebars of the bike and landed in the street on all fours. His hand got pretty cut up on the glass and it took them 20 minutes in the ER to get all the glass pieces out of it and to stitch him up. He was out of work for 3 weeks and couldn't drive. It was really a miracle that he walked away from the accident. And I thank God every day for it. Josh was most depressed about losing his beloved bike as it was totalled. So I thought he would appreciate a birthday card with this picture on it. The Ribbon Tag Nestability and black twill with the silver brads looks like the leather saddle bags he had on his bike. 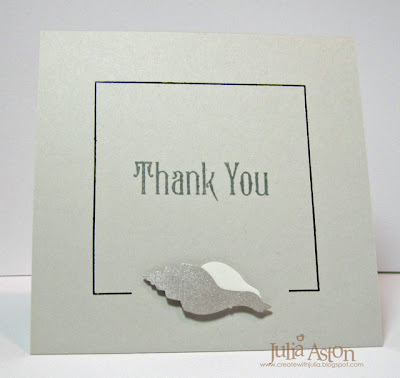 I silver embossed this perfect sentiment from the Free Spirit - Sentiments set by Waltzingmouse. It's funny - when I got this set and read all of the sentiments in it - I thought - well, that's an interesting one - but didn't think I'd ever have an opportunity to use it - so you never know when something will be just what you need to express your feelings! The panel is embossed with the Tim Holtz Bricked embossing folder. Josh is now back to work and riding a newer motorcycle similar to his first one but without the beautiful Indian head on the gas tank. Waltzingmouse November Release Blog Waltz! Hello dear friends! Welcome to the Waltzingmouse November Release Design Team Blog Waltz! All 4 new sets are available to purchase today! You'll want to start your waltz over at Claire's blog to be sure you don't miss anything. 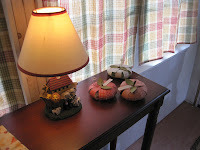 If you came here from Sandie's blog you're in the right place. For my first card today, I used the new Festive Foliage set as well as the frame from last month's release - Frame It and a text stamp from Text It. I stamped the frame and then masked outside the frame. Next I stamped the text and foliage inside the box, removed the mask and stamped the sentiment. For my final card I used the new set Twas the Night Before Christmas. 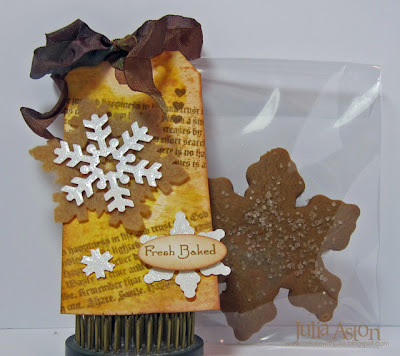 I stamped just the first verse of the famous poem (the stamp is of the complete poem) and then randomly stamped some snowflakes on the panel and card base. I stamped the window and the sleeping mouse, colored it with copics and again added some snowflakes. Everthing is sponged with Antique Linen. The panel, window and snowflake are up on foam dimensionals. I punched the snowflake and added a button and rhinestone in the center. Do you like my little metal mouse?! I got him this summer at an Antique/Gift Shop called The Galleree on Main St in Rockport, MA. I have him sit on my work table in my craft room but thought he would look quite appropriate in the photo of my card today! Remember to leave comments on all of the DT's blogs as well as Claire's as you waltz today - there will be two chances to win a WMS stamp set! AND be sure to go to the Waltzingmouse Store to order the stamp sets that tickled your fancy this month!! ETA: The contest ends at 11:59 pm EST Tuesday, November 9th. Winners will be announced on the WMS Blog. I hope you enjoyed and were inspired by all of our cards and projects this week! I certainly had fun creating mine. 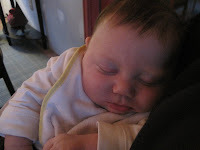 I'm the end of the blog waltz today - thanks SO much for stopping by. Which set was your favorite this month? Ink: Memento Potters Clay, Ranger Distress - Forest Moss, Peeled Paint, Bundled Sage. Accessories: Foam dimensionals, rhinestones - Kaiser, Labels 9 Nestabilities, button PTI, glue dots, Copics: BG11, E35, R08, Martha Stewart snowflake punch. Today I have some note cards to show you using the set called Festive Foliage. 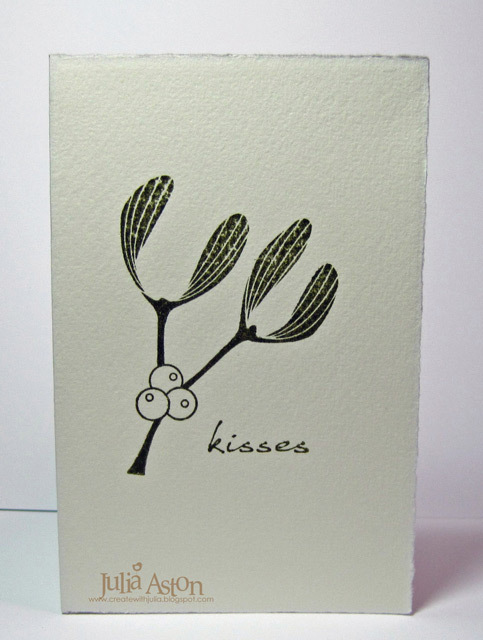 Every year I send out hand stamped cards for Christmas (as I'm sure you do too!) and I'm always trying to find a design that's easy to duplicate but still causes a 'gasp' when the receiver opens it! This stamp set fit my requirements! These cards are as clean and simple as you can get - and yet, I think, they look stunning! I used Fabriano Note Cards that have a luxurious slightly textured feel and a lovely distressed edge. 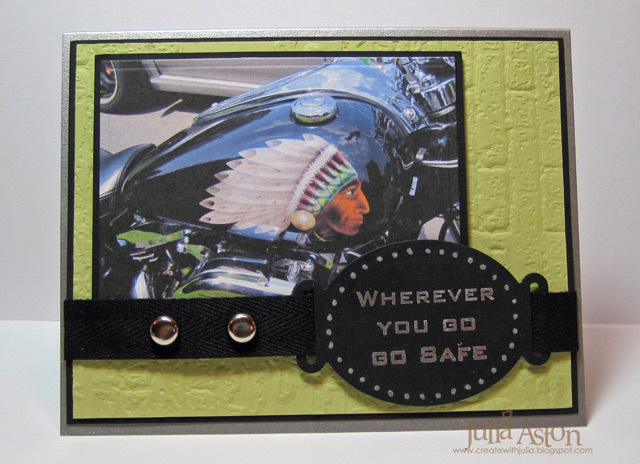 I stamped my images and sentiments directly on the card using just one or two colors. The pine bough and cone above are separate stamps. 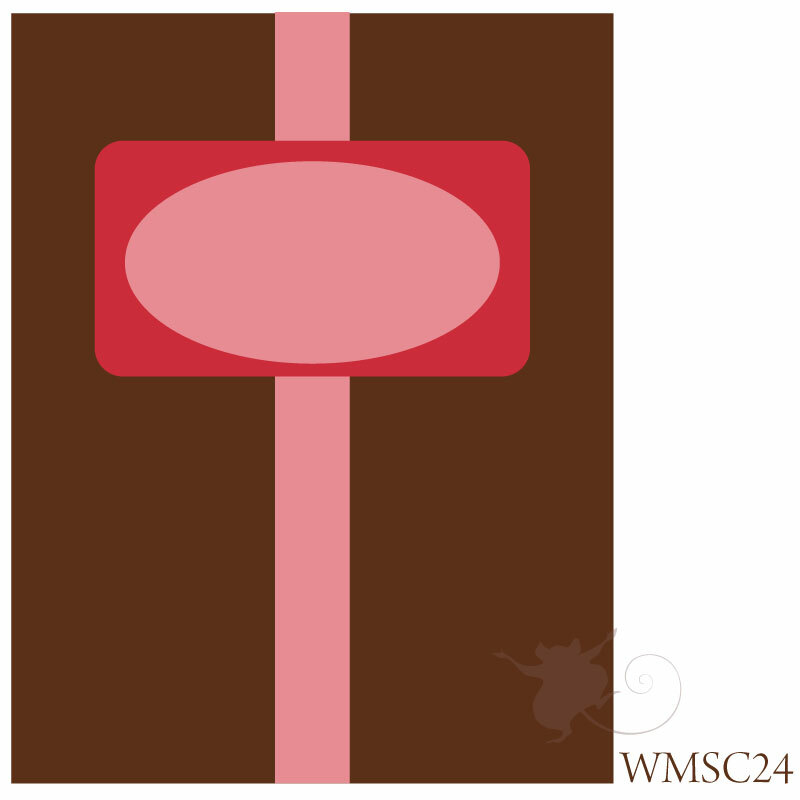 The bough is stamped with Forest Moss and the cone is stamped in Potters Clay. 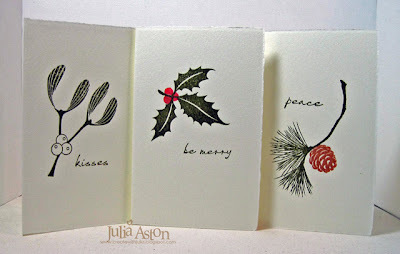 The holly below is stamped with Forest Moss and the separate berry stamp is stamped with Lady Bug. Tomorrow is the long awaited new release day and Claire and the Design Team will be having a blog waltz! 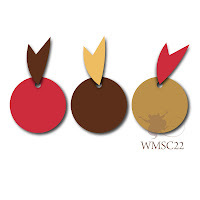 As is Claire's tradition - you will have two chances to win a Waltzingmouse Stamp set just by leaving comments on all our blogs - so be sure to have your WMS shopping list ready and stop by tomorrow at 2 pm EST!! Oh - and just since I was stamping up a storm - here's my card for the Saturday Waltzingmouse Sketch Challenge WMSC22. These pretty wreaths are from Around Christmastime the sentiment is from Nutcracker Sweet. ETA: Check out the WMS Sketch Blog and get inspired by the cards the Mischief Makers and other DT members have created using this week's sketch. Then make your own card using the sketch and link it on the Sketch Blog by Thursday 11/11/10 at 11:59 pm EST - you could be chosen Top Mouse next week!! Sometimes Claire offers little random winner prizes too - you never know! And finally - here's the rest of the Design Team for you to check out their sneak peeks today! Thank you all so much for your lovely comments left on my 1st WMS sneak peek yesterday! And I welcome you to Sneak Peek Day #2! Just 2 more sleeps until the release on Sunday!! 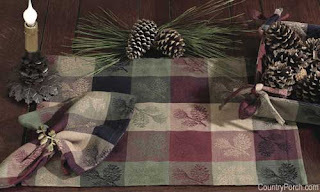 For my sneak peek today - I'm using Around Christmastime. 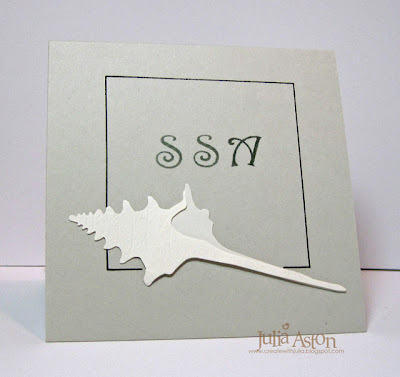 I stamped just half of the round snowflake stamp off the edge of my card and stamped the large and small 'branches' around it. I went over all the lines with my glue pen and added glitter for some pretty 'snowy' sparkle. It shows up much better IRL! Then I stamped the sentiment in the top corner. My treat bag is made from a 6"x9" Catalog Envelope from Staples! 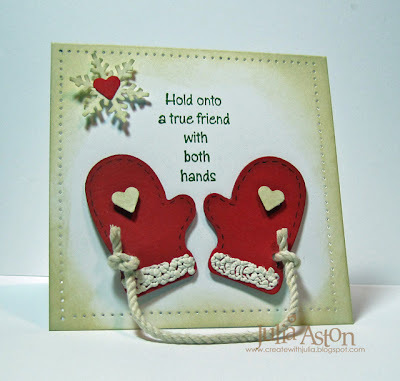 Ellen Hutson has a great tutorial for making this on her blog here. placement of the image. Now off you go to see the inspiration from the rest of the DT! See you tomorrow for Day #3?! Accessories: Quicky Glue Pen, Dazzling Diamonds - SU, ribbon - PTI, jumbo eyelets - SU, foam dimensionals, Martha Stewart snowflake edge punch. 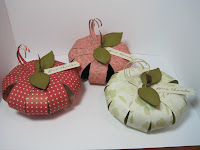 Waltzingmouse Nov Sneak Peek Day #1 - Ornaments! 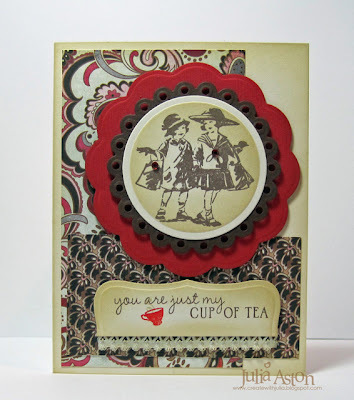 Hi dear stamping friends! Welcome to the 1st day of the sneak peeks for the November Waltzingmouse release. 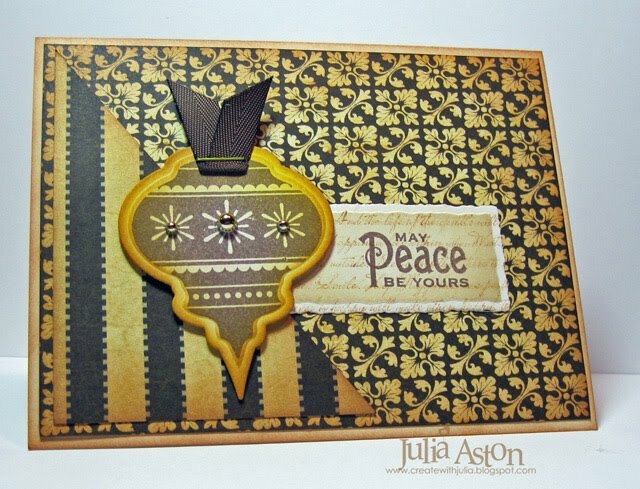 Today I'm using a beautiful ornament set called Vintage Ornaments - and they just happen to 'fit' in the Heirloom Ornament Nestabilities! Whoo hoo!!! 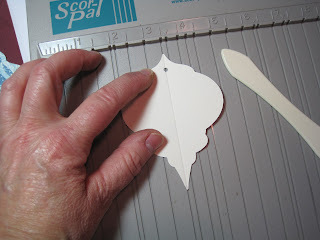 But, never fear if you don't have the nesties - the ornament stampings are also very easy to hand cut! 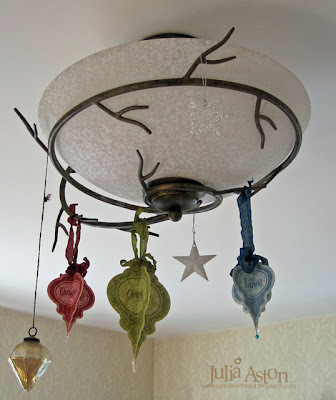 This is what the overhead light in my diningroom will look like this Christmas season. 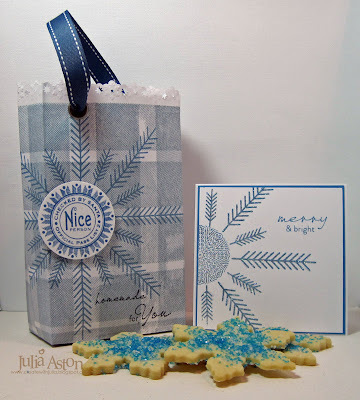 I stamped three of the five ornaments included in this set directly on these pretty patterned papers, stamping the three sentiments in their centers. 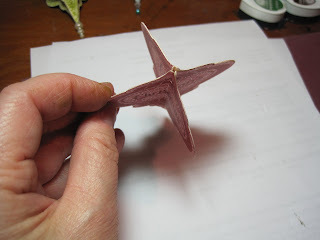 Here are a few pics of how I made each of these 3D ornaments. 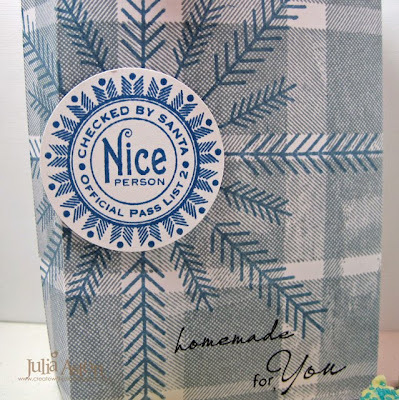 First I stamped the image 4 times and cut them out punching a hole in the top for the ribbon. 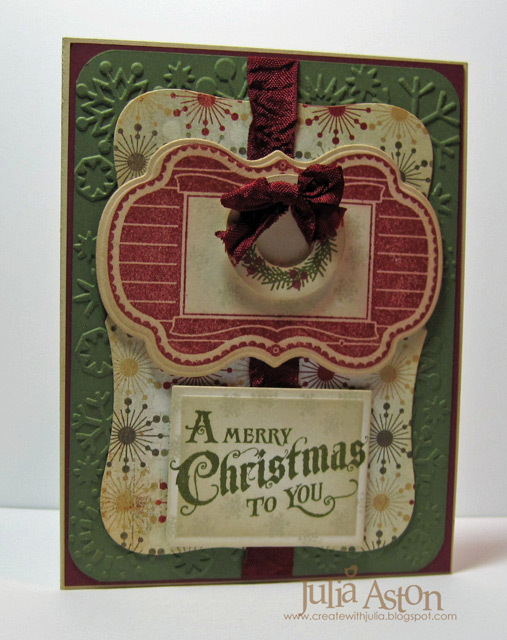 Some of the sentiments I used are from last years sets - Very Vintage Christmas and Seasons of Love. I scored a line down the center of each piece on the back. I folded each piece on the score line, then glued the pieces together. Here's how it looks from the top after all the pieces are glued together. I used a needle threader to help me get the ribbon through the small punched holes. 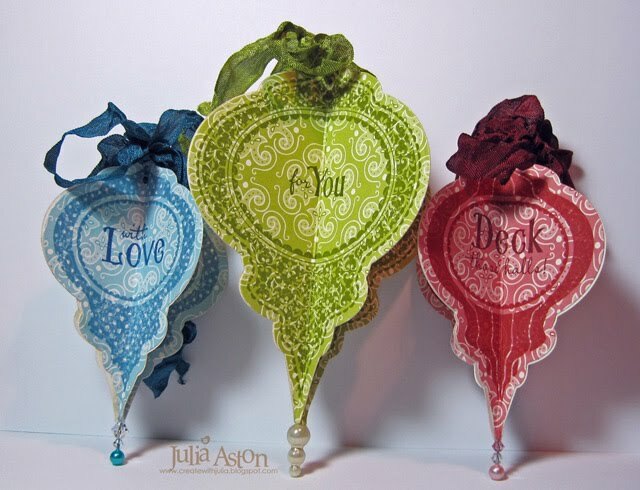 To finish them off - I just glued a jewelled pin into the base of each ornament. 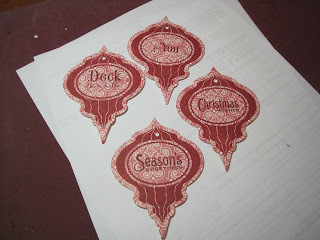 What would you make with these wonderful vintage ornament stamps this holiday season?? Now you'll want to check out the rest of the DT's peeks for today! Stamps: Waltzingmouse - Vintage Ornaments (to be released 11/7/10), Seasons of Love, Very Vintage Christmas. Ink: Ranger Distress - Peeled Paint, Forest Moss, Fired Brick, Aged Mahogany, Stormy Sky, Chipped Sapphire. 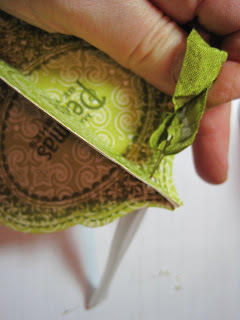 Accessories: Scotch Quick Drying Adhesive, cropadile, wrinkled seam binding - http://www.prairiebirdboutique.etsy.com , heirloom ornament Nestabilities, pins & crystals - Mark's Finest Papers.